With panoramic mountain and ocean views, the affluent community of Rancho Sante Fe has come to symbolize the ideal of elegant rural living. Recognized by the State of California as a California Historic Landmark, Rancho Santa Fe is the ultimate planned community where average residential lot size is in excess of two acres and the traditional Spanish, Mediterranean or Ranch style estates are flanked by fragrant citrus and native foliage. 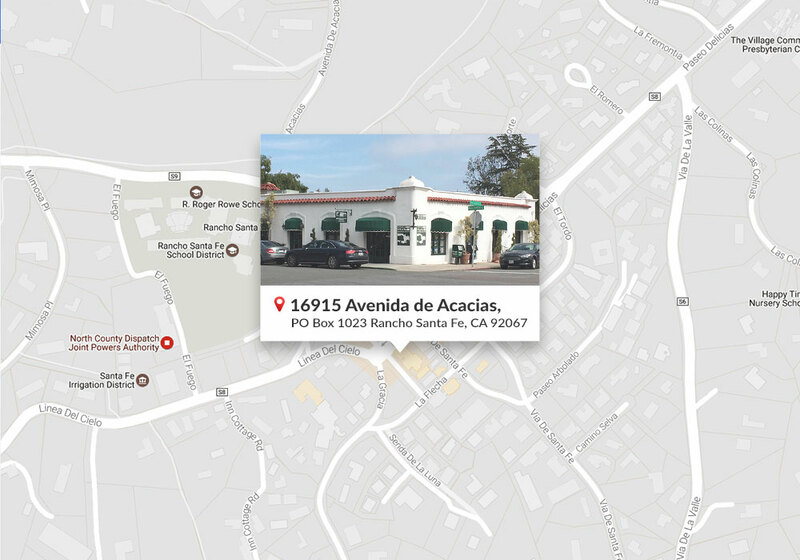 Located just four miles from the coast and twenty miles from downtown San Diego, Rancho Santa Fe is well known for its abundance of recreational opportunities, largely the multitude of equestrian trails and facilities. The popular San Diego Polo fields offers world class playing fields, lessons, stables and an exercise track. Outstanding golf courses, are situated throughout the area including two exclusive private courses, The Rancho Santa Fe Golf Club, and The Bridges at Rancho Santa Fe, available to homeowners within the community, and the public Morgan Run Club and Resort. Tennis, hiking, shopping, and fine restaurants add to the town’s ambiance and designed to enrich your lifestyle. The community actively supports charitable and educational organizations, cultural activities, live theatre, art and music. With an excellent school system, communities of Rancho Sante Fe include: The Covenant, Fairbanks Ranch, The Crosby, Hacienda Santa Fe, Rancho del Rio, Whispering Palms, The Groves, Rancho del Lago, South Point Farms, Stonebridge, Diegueno Hills, Rancho Valencia, Del Rayo, Rancho La Cima, Stratfor, Montecito, Senterra, Horseman's Valley, Morgan Run, The Summit, and Rancho Santa Fe Farms. In addition, there are newer communities such as The Bridges, Rancho Cielo, Rancho Santa Fe Farms Estates, The Lakes and Santa Luz.